Large-scale combined studies of nDNA and mtDNA have yielded phylogenetic trees for mammals that generally fit the conclusions derived from traditional morphological comparisons, but also show some differences in detail. For instance, molecular data have generally confirmed that the monotremes branched away first in the mammalian tree and that there was a subsequent division between marsupials and placentals. Interestingly, however, comparisons of complete mtDNA sequences have suggested that the monotremes and marsupials form a group separate from the placentals (Marsupiontia). As this aberrant result conflicts with other molecular evidence as well as with a well-established body of morphological evidence, it probably reflects an artifact of some kind. Indeed, it is noteworthy that the main points of conflict between different molecular trees involve relatively deep branches in the mammalian tree, which are precisely the branches that have posed the greatest challenges in morphological studies. Nevertheless, there is a gathering consensus from broad-based molecular studies that there are four major groups of placen-tal mammals (Afrotheria, Xenarthra, Euarchontoglires and Laurasiatheria). As there are a number of consistent novel features of these groups, some modifications of conclusions based on morphological studies are undoubtedly required. For instance, the existence of the assemblage "Afrotheria" had not been identified from morphological comparisons and was first revealed by molecular studies. Moreover, it would seem that the order Insectivora is not only an artificial grouping of relatively primitive mammals (as has long been expected) but in fact includes widely separate lineages that belong either in Afrotheria (tenrecs, golden moles) or in Laurasiatheria (hedgehogs, shrews, and moles). Overall phylogenetic trees for mammals based on molecular data have been calibrated in a variety of ways, and a fairly consistent picture has emerged. This conflicts with the long-accepted interpretation, according to which the evolutionary radiation of modern mammals did not begin until the dinosaurs died out at the end of the Cretaceous, 65 mya. Instead, it would seem that the four major groups of placental mammals began to diverge over 100 mya and that many (if not all) modern orders of placental mammals had become established by the end of the Cretaceous. 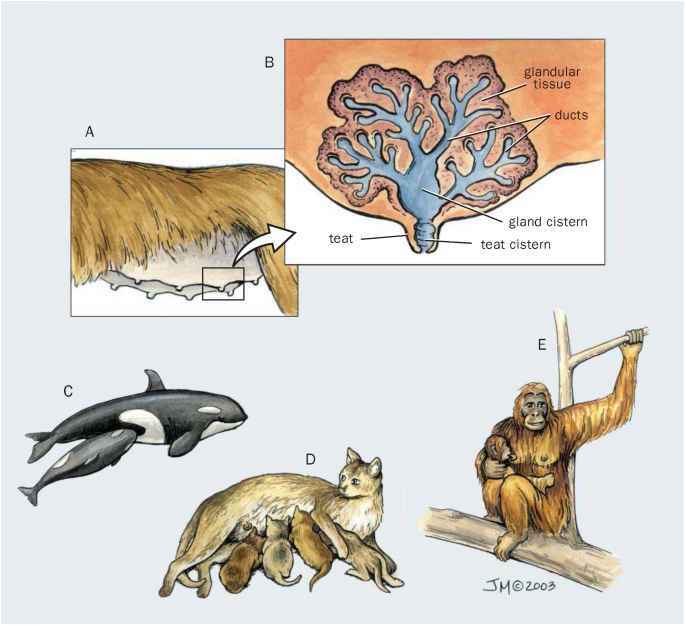 For instance, numerous lines of evidence indicate that primates diverged from other placental mammals about 90 mya. This revised interpretation of the timing of mammalian evolution is significant not only because it indicates that dinosaurs and early relatives of modern placental mammals were contemporaries, but also because it suggests that continental drift may have played a major part in the early evolution of mammals. Contrary to the long-accepted interpretation that the evolutionary radiation of modern mammals began after the end of the Cretaceous, the new interpretation based on molecular data indicates that the early evolution of both placental mammals and marsupials took place at a time when the southern supercontinent Gondwana was undergoing active subdivision. As one outcome of this process, it seems that the endemic group Afrotheria became isolated in Africa.